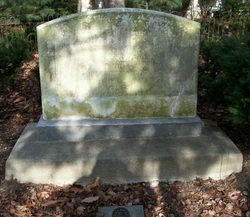 Inscription: "Within this enclosure is the remains of William and Mary Matlack who came to west New Jersey from England,William in 1677 and Mary in 1681, the first of the name the ancestors of the family in America. Here also lies the remains of Richard Matlack, a son of William and Mary and part of his children Also a number of the servants and slaves of the family. " The Matlack Family Burial Ground is located between two houses on the 500 block of Balsam Ave in Cherry Hill. The Matlack family has been well researched and documented (lucky for me!). The name Matlack has been known to be spelled Matlock and most who stayed in England used that spelling. Eventually the generally accepted spelling of the name in America is Matlack. William and Mary married when he was 34 and she was 16. William acquired large tracts of land in Burlington County and Gloucester County. See 1970 article from the Courier Post regarding this family. Mary's family was from Brailes, Warwickshire, England. (I) William Matlack, or as his family name appears in some old records, Macklack, was born in England about 1648, and was one of the colony of Friends who came from Cropwell Bishop, a small village in Nottinghamshire, in the year 1677, in the ship "Kent," Captain Gregory Marlowe, and was sighted off Sandy Hook August 14, of that year. The vessel followed along the coast to the mouth of the Delaware river, up which it sailed to Raccoon creek, where her passengers disembarked. The commlssioners appointed by William Penn and the other proprietors, and William Matlack with them, took a small boat and went up the Delaware river to Chygoes island (whereon Burlington now stands) almost surrounded by a creek named for an Indian sachem who lived there. Matlack was the first to leave the boat, just as in later years he was foremost in the work of development of the region in various other respects. He was a carpenter and built, or helped to build, the first two houses in Burlington and also helped to build the first corn mill in West Jersey. It is related that as the boat neared the shore Matlack sprang to the bank and the first one to meet him was an Indian chief, between whom and Matlack a friendship was formed that lasted through life. He came over to America as an artisan in the employ of Thomas Olive, commissioner and proprietor, and after serving him four years bought from his former employer one hundred acres of good land between the north and south branches of Penisaukin creek, in Chester township, Burlington county, as afterwards created. It is understood that the purchase price of the land thus acquired was his four years' service and "current county pay." The greater part of this tract is still owned and in the possession of William Matlack's descendants. At the time of his immigration to America William Matlack was a young man less than thirty years old. "He saw a town rise up in the midst of the forest, surrounded by a thriving population, busy in clearing the land and enjoying the reward of their labors. His leisure hours were spent among the natives, watching their peculiarities and striving to win their good will. Following the advice and example of the commissioners, every promise made by him to the aboriginees was faithfully kept, and every contract strictly adhered to." He and Timothy Hancock, with whom he worked in common in many things, "soon found their neighborhood was a desirable one; for new settlements were made there in a short time, and went on increasing until a new meeting of Friends was established at the house of Timothy Hancock by consent of the Burlington Friends in 1685." In 1701 William Matlack purchased about one thousand acres of land in Waterford and Gloucester townships, in Camden county (then Gloucester) lying on both sides of the south branch of Cooper's creek. In 1714 he gave to his son George five hundred acres of land in Waterford township, being part of the one thousand acre tract purchased of Richard Heritage. In 1717 he bought two hundred acres of John Estaugh, attorney for John Haddon, and there his son Richard settled in 1721. In 1714 he gave his son Timothy the remaining part of the Heritage purchase, and on this tract Timothy settled and built his house. The tract of lands owned by William Matlack and his sons, John, Timothy and Richard, extended from the White Horse tavern on both sides of the highway and contained about fifteen hundred acres. William Matlack, immigrant ancestor, married Mary Hancock, and of this event Mr. Clement writes thus: "In 1681 there came from Brayles, a small town in the southern part of Warwickshire, a young man named Timothy Hancock, accompanied by his sister, who was about fifteen years of age. Without friends or means, they lived in a very humble manner among the settlers, but the demand for work soon found Timothy employment, and the demand for wives did not leave Mary long without a suitor." She married William Matlack in 1682, and they then removed to a tract of land which he had located between the north and south branches of Penisaukin creek, in Chester township. Her brother also located an adjoining survey, and in 1684 married Rachel Firman. Thus it is that the Matlack family of New Jersey—a prolific family indeed—began with William and Mary. Just when William died is not certain, but it was after 1720, and he lived to see his youngest daughter the mother of seven children. Tradition says that he died in his ninetieth or ninety-first year, "and would have lived longer if his tools had not been hid from him, for he took delight in having his accustomed tools to work with, and when he could not have them he died." "28 slaves in the compass of Haddonfield Meeting freed, but, Jacob Jennings, Samuel Clement, William Cooper, Isaac Horner, Joseph Morgan, John Barton, Hannah Ladd, Elizabeth Mickle, not yet complied but appear uneasy on account of the Slavery of their negroes, Richard Matlack, Jacob Stokes, Marmaduke Cooper, Joseph Nicholson and Elizabeth Iredell seem not disposed to set theirs free."